Adding plyometric drills to your golf weight training routine is a great way to further develop leg strength. They also are a great way to add variety to your workout if you get tired of performing the same exercises over and over. Plyometric drills, by definition, are rapidly performed exercises focusing on quick bursts of strength. These exercises can be performed for a variety of different sports, in addition to golf. They are functional exercises, which means that they have a direct translation to sport specific motion. A proper golf swing depends on quick muscle contractions throughout the entire body. You can do a thousand leg extensions at your local gym to build quad strength, but that motion doesn't promote a quick contraction. Plyometric exercises can be performed for all the key muscles of the golf swing. 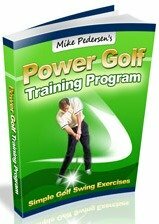 This page will focus on strengthening the lower extremities in order to develop a solid base and good weight shift during the proper golf swing. -Start by balancing on your right leg. -From that position, perform a small jump directly to your left and land on your left leg, and then balance again. -You can vary the size of your jumps in order to make the exercise harder, but always end by balancing on the landing foot. Also, make sure that you bend your knees slightly whenever you land to absorb your body weight. -Start by standing with your feet shoulder width apart. -The key of this plyometric exercise is to have a smooth transition between jumps. Perform a small squat and then jump a few inches in the air. -When you land, bend your knees to absorb the impact and then immediately jump back up and repeat. -This exercise can be made harder by increasing the depth of your squat and/or jumping higher into the air. -Very similar to the jump squats, where you want a smooth transition between jumps. Start standing with your right foot in front of your left. -Perform a small lunge and then a jump, but switch the position of your feet when you land, now with your left foot in front. -Land softly and bend your knees, then make a quick transition to the next jump. -Starting by balancing in your left leg. Perform a jump laterally to your right and land only on the right foot. -Now, jump back and to the left, landing on the left foot again. -Balance there, and, again, jump laterally to the right and balance on the right foot. -To complete the figure 8, jump forward and to the left, landing/balancing on the left foot. -Repeat the same exercise starting on the right foot, and jumping to the left initially. As mentioned above, plyometric drills are not for everyone. Please do not try them if you are apprehensive, or have a history of lower extremity problems.